Find out what is a construction withholding tax in Germany (Bauabzugsteuer). Below you can find the detailed information for companies providing the construction services in Germany, how legally avoid the construction withholding tax and how to get it back if the construction witholding tax has been deducted. A large group of foreign companies provides construction services in Germany. If construction services are provided to another entrepreneur (as defined for VAT purposes), they request an exemption certificate (Freistellungsbescheinigung ). Below you can find detailed information about construction withholding tax in Germany. What is a construction withholding tax in Germany? Construction withholding tax in Germany, also known as a construction tax (Abzugsbesteuerung bei Bauleistungen, Bauabzugsteuer ), is a type of income tax advance in Germany. Many companies mistake it for VAT. The construction withholding tax in Germany has nothing to do with VAT. The concept of this tax is relatively simple. If construction services are provided in Germany to another entrepreneur, the contractor (recipient of the construction works) deducts 15% from the payment and forward the withheld amount to the competent tax authority in Germany. A company from Poland performs a construction service in Berlin for a German developer. A remuneration of EUR 200,000 was agreed. The Polish company issued an invoice for a full amount, but the contractor only paid 170,000 euros. The deducted amount of 30,000 euros was forwarded to the tax office in Cottbus, which is competant in Germany for this Polish company. Is the deducted construction withholding tax in Germany lost? The deducted construction withholding tax in Germany is only an advance on income tax. A construction company whose contractor has deducted this tax may apply for a tax refund. To obtain a refund of construction withholding tax in Germany, an appropriate application must be submitted to the German tax office. Along with the application, you must complete a tax registration and obtain a German tax number (Steuernummer). The application must often be accompanied by a number of documents (contracts, invoices, residence certificate, list of employees, etc.). If the tax office decides that we have performed all tax obligations in Germany and there is no risk that any tax arrears will arise in the future, then the tax will be refunded in full. Is there a limitation period within which you can apply for a refund of construction withholding tax in Germany? A refund of construction withholding tax in Germany may be applied no later than the end of the second year counted from the end of the year in which the construction tax was deducted in Germany. If, for example, a construction withholding tax in Germany was deducted in May 2018, you can apply for a refund by the end of 2020.
Who deducts the construction tax in Germany? The construction tax in Germany is deducted by the recipient of the construction service, i.e. the one who pays for the construction service, if it is an entrepreneur. If the contractor is a private person, construction withholding tax in Germany is not deducted. The issue of construction services tax arises only between two firms (taxable persons under VAT rules). It does not matter where the client (contractor) and the company providing the construction service come from. For the purposes of construction withholding tax in Germany, it is only relevant that the contractor is to be an entrepreneur. He may be from Germany, but he may also be from Poland, UK or Spain. Foreign companies that have their subcontractors form other country than Germany often forget about it. If e.g. a Polish company commissions a construction service in Germany to another Polish company as subcontractor, it is also obliged to deduct a 15% construction withholding tax. If she does not, she is responsible herself for this tax. A penalty of up to 30,000 euros can be imposed. The Polish company has a contract to build a house in Germany. She subcontracted some of the work to an electrician from Poland who has his own business. The payer paid the electrician the entire remuneration of EUR 5,000. The German tax office found out about the lack of deduction and ordered the Polish client to pay the amount of EUR 750 including interest as construction tax in Germany. Is it possible to protect against tax deduction? The German construction tax regulations provide for the possibility of obtaining a construction tax exemption in Germany ( Freistellungsbescheinigung nach §48b EStG ). A company providing construction services is applying for an exemption from construction tax in Germany. Each construction company must apply for such an exemption. It is not important whether the principal of the construction company also has such an exemption. A company from Germany commissions a French construction company A to build a warehouse in Germany. The French company A has submitted and obtained an exemption from construction tax in Germany. The French company A sub-contracts some of the construction works (building foundations) to another company B from Poland. Company B does not have exemption from construction tax in Germany. Part of the work was also commissioned to an electrician from Austria, who has an exemption from construction tax. Company A will receive the entire remuneration from the German contractor, because it has an exemption for itself. When paying remuneration to company B, company A will have to deduct 15% of the remuneration and pay this amount to the tax office competent for company B. The electrician from Austria will receive the entire remuneration because he has his construction tax exemption in Germany. 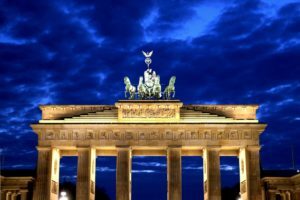 How to get a construction withholding tax exemption in Germany? The first exemption certificate will usually be granted for three months. To extend it, the German tax office will call the company again to submit specific documents. The extension usually takes place for the next 12 months. It is important to remember that before the expiration of this period, you have to apply again for an extension of the exeption, so that the company always has a valid construction withholding tax exemption certificate in Germany. Until the end of May the following year (e.g. for 2017 to 31/05/2018), the German tax office must be provided with documents that will enable it to check whether a foreign company has been obliged to pay income tax in Germany. Documents must be submitted without a separate request. These documents include a questionnaire, a list of work done in Germany, a list of employees posted to work in Germany, a copy of the annual tax return. By not submitting these documents, the company runs the risk that its exemption certificate will not be extended. What really lies behind the construction withholding tax in Germany? The idea of ​​construction withholding tax in Germany is plain. This is to counteract the illegal construction work. The construction tax forces foreign companies to contact the German tax office. Either a foreign company applies for an exemption certificate or does not receive 15% of remuneration. Obtaining an exemption certificate or its extension requires submission of a large number of documents. The same applies when applying for the refund of the already deducted construction withholding tax. On the basis of these documents, the German tax office can catch a lot of circumstances that will make it necessary to pay German income taxes. The requested documents indicate whether the so-called permanent establishment in Germany was created or whether employees have exceeded 183 days of residence in Germany in the last 12 months / fiscal year. Foreign companies often do not realize this, and on their own, without a tax consultation, they apply for a refund of construction tax or for extending an existing exemption certificate. Often this ends with the obligation to pay income tax in Germany in the thousands of Euros. It is always worth consulting your business in Germany with a specialist in the field of German law. The JLT law firm provides comprehensive legal and tax support for companies in Germany, including registration and all notifications in Germany. Our law firm in particular supports foreign companies in obtaining a construction tax exemption certificate in Germany. Legal and tax consultancy services in Germany are provided as part of cooperation with German specialists. Legal and tax matters in Germany are then coordinated by a legal advisor or a tax advisor from the JLT law office.